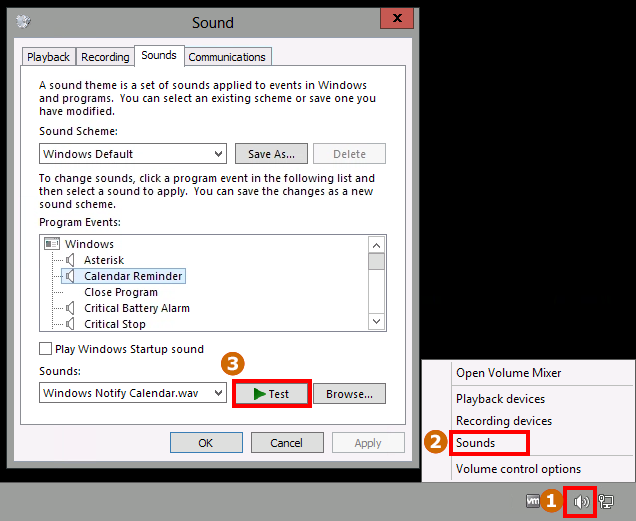 If audio isn’t working correctly, try these suggestions. It can take a few minutes for an audio-enabled VM to be ready. The VM has to start, then the operating system has to start, and then the RDP service has to start. 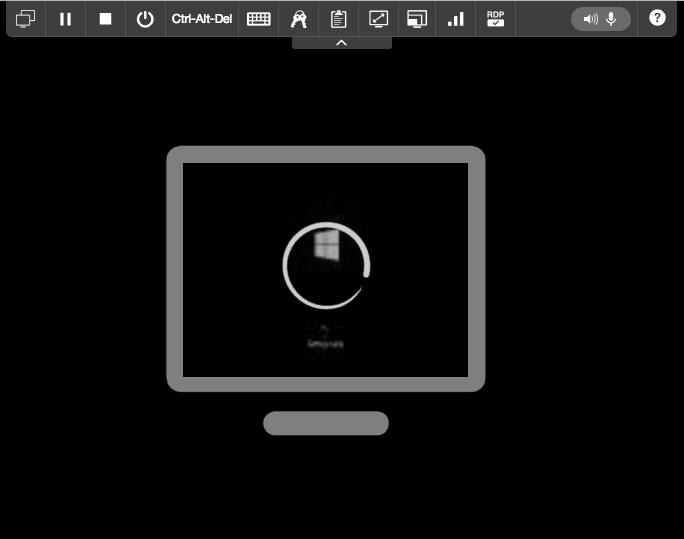 To give you better visibility while the RDP session is waiting to load, the browser client displays a thumbnail preview of the VM desktop after the VM is booted and as soon as the operating system becomes responsive. A spinning icon indicates the RDP session is still waiting to load. Verify that the guest operating system boots. Switch the connection type back to RDP (audio capable). Make sure you’re using an RDP connection to the VM. In the toolbar, click (Connection Type and Audio). The Connection Type and Audio dialog displays. 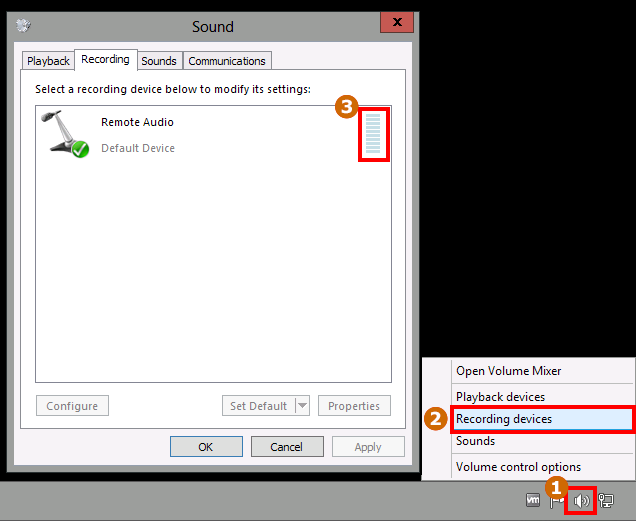 Select RDP (audio capable), and then click Apply. If you don’t have Connection Type and Audio settings, contact your instructor or administrator. Right-click the speaker icon in the notification area of the Windows toolbar. Select a sound from the menu and click Test. The audio plays from your computer speakers. Check the volume of your system. Are your speakers muted? Check the VM operating system Remote Desktop settings to make sure that Network Level Authentication is off. Select RDP (audio capable), and then click Apply. If you don’t have Connection Type and Audio settings, contact your instructor or administrator. Make sure your browser allows audio from your microphone. On Google Chrome, you should see a red circle in the browser tab. In Firefox, you should see a microphone icon at the top of the browser window. Chrome – Use your camera and microphone in Chrome. Firefox – Enabling the microphone in Firefox. Select Recording devices. The Sound dialog displays with the Recording tab selected. This shows the recording devices for the VM. You should see a microphone icon and an audio meter next to it. Try speaking into the microphone. The audio meter should respond to the level of your voice. Poor performance is usually caused by limited connection bandwidth. Audio adds to the amount of bandwidth that the VM needs. To use audio-enabled VMs, we recommend at least 1.5 Mbit/s (187.5 Kbyte/s) for each audio-enabled VM browser session. For help, see Improving performance during a browser client session. This occurs on a local computer running Windows 10 Creators Update (1607). Update the local computer to Windows 10, Fall Creators Update (1709) to resolve this issue. If there is an error connecting to the VM over RDP, the browser client may display one of the following error messages. Click the name of an error message to learn more about how to resolve it.